From killing black money to battling terror to enabling a cashless economy, there's been a rapid shifting of goal posts. Exactly a month ago, Narendra Modi announced what is perhaps the single biggest economic decision ever taken by an Indian prime minister: from midnight, Rs 500 and Rs 1,000 notes would be demonetised. At one stroke, Modi had reduced 86% of India’s currency to scraps of coloured paper. Why did he do this? His televised speech on the evening November 8 was clear: to eliminate black money. As this India Spend article says, “the Prime Minister uttered the phrase “black money” 18 times in this speech”. The other target of the move was terrorism. This was Modi’s argument linking demonetisation and militancy. Narendra Modi on November 8. 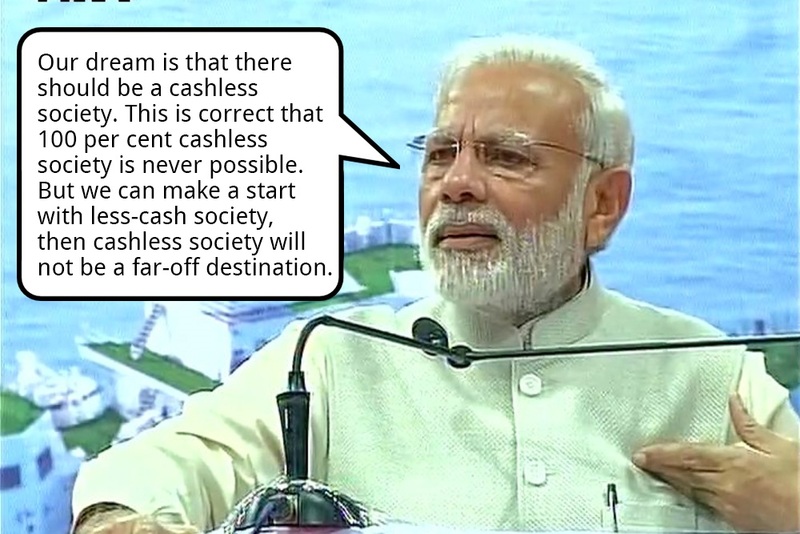 Narendra Modi didn’t mention cashless a single time in his November 8 speech. However, as the black-money drive became increasingly fruitless with large amounts of cash in circulation returning to the banks, the focus shifted to digitisation of transactions and the elimination of cash itself. By the time the prime minister went on air to deliver a radio broadcast on November 26, the aim of demonetisation it seemed had primarily become turning India into a cashless economy. The Big Villain of November 8 – black money – had receded. By November 26, Modi had shifted the aim to a cashless economy. For a drive that was meant to deliver a cashless society, it might be noted that demonetisation actually ended up adding a large denomination banknote to India’s currency: Rs 2,000, double in value of the largest note till November 8. Not only is the aim of cashless bellied by this, the very act of forcing large-scale digitisation on a poor country where regular internet access is itself a luxury seems inexplicable. As of November 8, demonetisation was supposed to wipe out hoards of black money stored in cash. The Big Hope of demonetisation of course was that this black money would be wiped out. Fearful of generating a paper trail, black money hoarders would have to – with a heavy heart – throw away their money. The State Bank of India estimated that Rs 2.5 lakh crore may not return to the system. Initially, hysterical news reports of old notes being dumped in rivers made it to news channels. One month down the line, it’s clear nothing of that sort will happen. 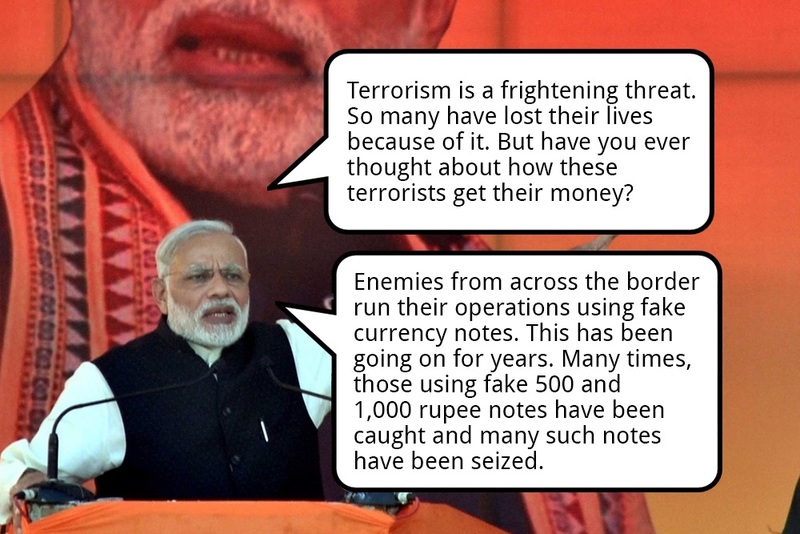 The fact that Modi’s very conception of “black money” was flawed was pointed out at the very beginning by economists. 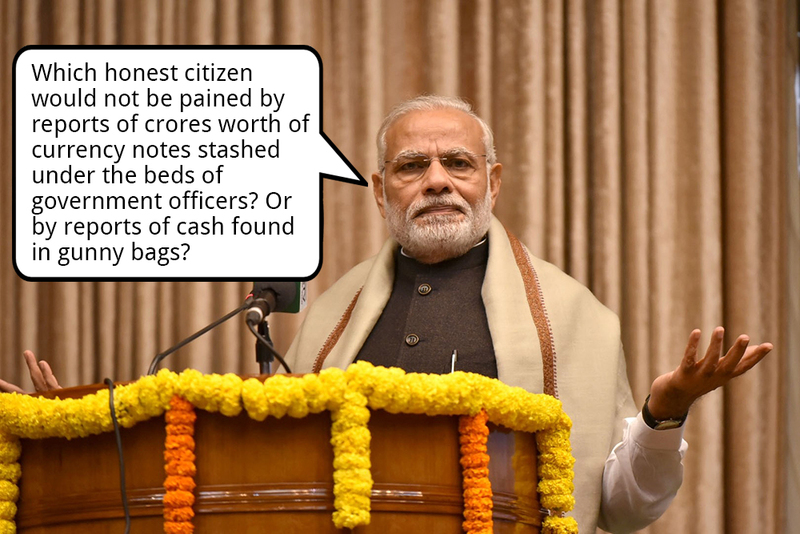 The government’s view of black money as bundles of notes being stuffed into mattresses was true only in Bollywood films. Most illegal wealth wasn’t in cash, it was in benami realty, bullion, jewellery and the such. One estimate puts the amount of illegal cash at merely 3% to 5% of the total black economy. It seems that the experts were right. Far from throwing away their black money, hoarders simple deposited it onto the system. On Tuesday, the revenue secretary announced that it expects the entire money in circulation in the form of currency notes of Rs 500 and Rs 1,000 that were scrapped on November 8, to come back to the banking system. The government would then trace the transactions and tax black money hoarders, claimed the Union government. This is, of course, easier said than done. If tax authorities could simply use investigative methods to ferret out black money, they would have done that in the first place, without the need for drastic schemes like demonetisation. In a country as large as India, bureaucrats going after black money will almost certainly fail to capture most of it. The Union government simply does not have the wherewithal to scutinise the crores of bank accounts that have now been stuffed with cash. Two weeks after demonetisation, the government described black money a “crime against humanity”. Anyone who spoke against demonetisation was branded a black money hoarder by Prime Minister Modi. himself A moral narrative was sought to be created for demonetisation. Yet, after all that preaching, in the end, the Modi government was more than ready to give black money hoarders another chance. On November 28, the Union government introduced a bill in the Lok Sabha which created a new amnesty scheme for black money holders. By paying a 50% charge, black money holders would be able to convert their wealth into legal money. This was an incredible climb down from the moral heights of November 8, when black money was sought to be equated with terrorism itself. Should the government force Indian citizens to part with their hard-earned money? Common sense would say no to such statism. After all, demonetisation was aimed at the big money bags who has stashed away illegal wealth right? Why would the state bully the common man with it? Well, that was then. On December 7, the Union government announced that demonetisation had been carried out to force Indians to put “domestic savings lying idle at home” into the banking system to lower interest rates. This comes at a time when Indians have been subject to globally unprecedented limits on the withdrawl of their own monies from bank accounts, making this sort of attempt to force Indians to deposit their cash into the banking system more than a bit sinister. If this sort of authortariasm seems scary, here’s another data point to help bake in that feeling: Venkaiah Naidu, a Union minister actually called demonetisation “the new Cultural Revolution”. Set in motion by the absolute rule of communist China in the 1960s and ‘70s, the Cultural Revolution saw persecution and mass torture resulting in the deaths of up to two million people.